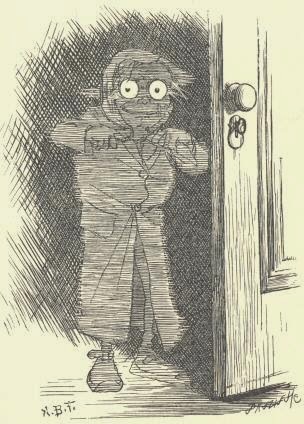 "Phantasmagoria Canto I (The Trystyng)" by Lewis Carroll is the Songs of Eretz Poem of the Day for March 26, 2014. It is in the public domain and is reprinted below in its entirety. The poem is the opening Canto in a series of seven first published in 1869 in the collection Phantasmagoria and Other Poems. A link to the free Gutenberg eBook Project version of the collection may be found here: http://www.gutenberg.org/files/651/651-h/651-h.htm. On which I said "Come, come, my man! That's a most inconsiderate plan. Less noise there, if you please!" "Out there upon the landing." "How came you here," I said, "and why? Come out! Don't shiver there!" You'd think it all a lie. As Men to fear the dark." We have to know by heart." The Rules that you allude to." "Thanks! You shall hear them by and by. This IS a piece of luck!" "What may I offer you?" said I. 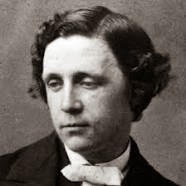 The renowned British author and poet, Lewis Carroll (1832 - 1898), was born Charles Lutwidge Dodgson. He is perhaps most famous for his fantasy novellas, Alices's Adventures in Wonderland (1865) (reviewed in Songs of Eretz May 14, 2012 http://eretzsongs.blogspot.com/2012/05/review-of-lewis-carrolls-alices.html), and Through the Looking-Glass (1872) (reviewed in Songs of Eretz September 18, 2012 http://eretzsongs.blogspot.com/2012/09/review-of-through-looking-glass-by.html. However, he was also a prolific poet; he included many memorable poems within the aforementioned novellas and authored several free-standing poetry collections. 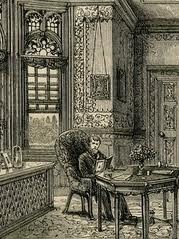 For his "day job," he was a Professor of Mathematics at the Christ Church College in Oxford. Reference to this and additional biographical information may be found here: http://www.poets.org/poet.php/prmPID/78. "The Trystyng" is comparable to the work of Carroll's American contemporary, Edgar Allan Poe, albeit with a light-hearted, humorous treatment of the paranormal elements. (Poe's works have been reviewed in Songs of Eretz on several occasions: http://eretzsongs.blogspot.com/2013/11/you-cant-have-poetry-without-poe.html, http://eretzsongs.blogspot.com/2013/09/review-of-sonnet-to-science-by-edgar.html, http://eretzsongs.blogspot.com/2013/01/review-of-acrostic-by-edgar-allan-poe.html, and http://eretzsongs.blogspot.com/2014/01/review-of-dream-within-dream-by-edgar.html). Carroll employed a delightful rhyme scheme (abaab, cdccd, &c), as well as a ballad-like rhythm scheme, having organized the poem in quintets of iambic tetrameter with the omission of a foot in the second and fifth lines of each. The omitted feet create a natural pause and slight emphasis as one might find in a ballad or song. The reaction of the first person singular character in the poem, presumably the poet, to his haunting is unexpected, funny, and excruciatingly nonchalant. The reaction of the phantom to this reaction is even more unexpected and funnier still. The eventual outcome, with the phantom sitting down and sharing supper and conversing with the subject of his haunting, is simply delicious. There is also a pun worth mentioning: "He was so utterly aghast"--a pun on "a ghast"--bazinga!